GUEST POST: Dennis Beckner, Youth Ministry Volunteer 20+ years and DYM Author! Knowing my small group boys would be graduating this year, I chose to do The Summer of Crazy last year. This summer, I’m reaping the youth ministry rewards of putting in the extra effort. Next school year will be much better because of it. Here’s the story: For the longest time, I wish I could have known my small group students when they were younger. It would help me know first hand what was in their pasts, which would help me understand their present. Last summer I decided to do something about it. I double-dipped into both our High School Ministry (my primary area of service) and our Junior High Ministry (a place I swore I’d never serve – which I turned out to love). I did two weeks of high school camp, a week of junior high camp, junior high guy’s trip, and a bunch of other events, etc. That’s why I call it The Summer of Crazy. I even got a nice trophy of a bruise from the Junior High Ice Skating Night. So fun. It was a struggle to not make my current students feel neglected or like I had moved on. That was especially tough because I’m a social-media junkie; everything I do that’s fun gets posted online. With so much going on, I don’t blame them for feeling that way. However, I also used that tension with my current students to cast vision. I told them why I was working with my upcoming students. By doing this, I was able to help them see the importance of taking a long view of life, rather than just letting it happen. Here’s where the benefits came in this year: Out of all of the students I met last summer, a few of them have begun to seek me out to ask if they can be in my camp cabin as Freshmen this summer, and in my small group next year. We’re way ahead of the game from where we would have been. I’ve even been able to do some counseling with them and some fun activities. If I waited for them to come up to 9th grade before I met them, getting started would have taken much longer and I wouldn’t know as much about them first hand. The Summer of Crazy turned out to be a great success. Something I’ve learned over time is that I need to have a strategic long view of youth ministry. To do that well, I need to be strategic about how and where I serve. This was the best, and most physically draining, decision I’ve probably ever made in youth ministry. 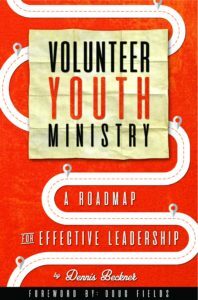 This, and many other youth ministry strategic ideas, are in my brand new book Volunteer Youth Ministry, A Roadmap For Strategic Leadership. I hope you’ll check it out. It was very fun to write and I know all youth workers (paid and volunteer) will enjoy it.